One of the problems with the proverbial bucket list is that whenever you tick a dive trip off the list, it seems that you add at least three more destinations to it. This is exactly what happened to me. I had never considered North Carolina as a dive destination, much less one of the top wreck diving locations in the world. But, after running across other wreck diving enthusiasts who frequented the “Graveyard of the Atlantic,” yet another destination was added to my list. 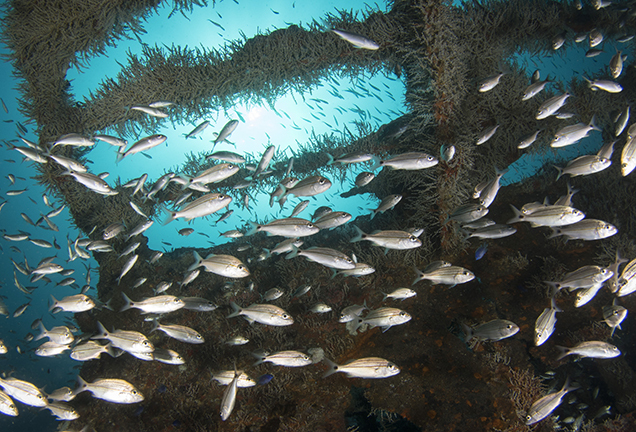 Schooling fish on Hardees Wreck, North Carolina, USA. Photo by Brandi Mueller. Wreck diving is one of my favorite types of diving because I love the history of how the wrecks came to be underwater, and North Carolina has plenty of that. The history of more than 2,000 wrecks lie in the waters off this eastern state and the stories range from pirates, the Civil War, World Wars, hurricanes, storms and other maritime mistakes that took down good ships. The Graveyard extends along the entire North Carolina coast. Over time, the coast of North Carolina has literally produced the “perfect storm” for captains and crew. The beautiful barrier islands, including the Outer Banks, sit offshore of the continent, along with shallow shoals that create sandbars miles off the coast. The flat islands and moving sandbars became (and still are) navigational hazards to sailors, particularly during the frequent bad weather and extreme storms common to the area. Underwater, strong currents run close to shore, which sailors would often take advantage of to increase speed, but this contributed to the risk of running aground on those islands and shoals. These conditions led to the demise of many ships and still do today. The date of the first recorded shipwreck in these waters is debated but records go back as far as the 1500s. Early on, pirates frequented the area, attacking ships transporting goods. Probably the most popular pirate ship discovery in the world was Queen Anne’s Revenge—Blackbeard’s famed ship. The ship ran aground in 1718, and soon after, Blackbeard was killed in battle. Found in 1996 just off Beaufort, the remains were salvaged and many of the artifacts are on display at the North Carolina Maritime Museum. Much of the museum is dedicated to the discovery and salvage of the ship. It is nothing short of incredible to walk around and gaze at artifacts from the late 1600s and early 1700s. In the past, not all the residents of the area had the sailor’s best interest in mind. There were men known as “wreckers,” who would walk horses with lanterns on their neck along the beach, thus causing an up-and-down motion of the light. This would confuse sailors to think there was clear water ahead and the captain would run his ship aground, then the wreckers would steal goods from the ships. Heading out to dive the Graveyard of the Atlantic with Olympus Dive Center, we visited one such ship that ran aground in 1943. The Portland got caught in a storm and ran aground on the shoals. This ship sits quite shallow in the sand (16m / 55ft) and is broken into several pieces. It is prone to low visibility and currents. But on the day we visited, conditions were quite good. Several sand tiger sharks were circling the wreck, along with a small swell—a cloud of hazy, lower-visibility water, which hugged the ship only to dissipate and return later. It made for a sort of misty, almost spooky effect over the wreck, particularly with the sand tiger sharks moving in and out of the cloud of murky water. We saw lots of fish on the wreck, including sheepshead and even a toadfish sitting on one of the boilers. Humans also played direct roles in the sinking of these ships through wars. Shipwrecks from the Civil War and both World Wars can be found (and are still being found) in the Graveyard of the Atlantic. During WWII, German U-boats sat off the coast of North Carolina and looked at the lights on the shoreline. They would spot freighters going by when the ships blocked out the shore lights, and because so many ships were torpedoed, the area became known as Torpedo Alley. Atlas. We dived several WWII wrecks including the Atlas, which was a tanker torpedoed by the German U-boat 552 in 1942, and the Caribsea, which was also sunk by a torpedo in 1942. These two ships swarm with bait fish and are popular ships on which to see sand tiger sharks, which were numerous during the course of our dives. Ashkhabad. We also visited the Ashkhabad, a Russian freighter sunk by a German torpedo in 1942. Most of the Ashkhabad has been reduced to debris in the sand, but the life it has attracted is incredible. The warm waters from the Gulf Stream push north past offshore North Carolina, bringing with them many unexpected Caribbean reef fish. I did not expect to see arrow crabs, toadfish, and even a few queen angelfish on this wreck, along with sheepshead, triggerfish and black sea bass, but there they were. The dive is quite shallow (20m / 60ft), allowing for a long bottom time exploring the wreckage and seeing the fish life. Wrecks continue to be sunk to this day, both accidentally and on purpose. The Graveyard is also home to many wrecks sunk as artificial reefs, the most recent of which was sunk on 22 August 2018. The tugboat Fort Fisher joined 26 other vessels that have either been sunk by using explosives or by cutting holes throughout the vessel and having water pumped in. These ships are first cleaned up by having all pollutants removed before being sunk to serve as a home for marine life. Often, corals and sponges will take over the structure of the wreck, and fish will begin to amass around the ship, which of course then attracts larger fish. The artificial wrecks are popular with both fishermen and divers. Hardees Wreck. During one of my dives, we visited the Hardees Wreck (Hardees helped fund the project to sink the ship). The beautiful wreck was covered in corals and sponges, and because it was sunk artificially and cleaned up prior to sinking, there were some easy penetrations to get inside the wreck. Many small fish take refuge inside the ship and beautiful purple fans grow on the walls inside the ship. The problem with North Carolina diving is also probably what adds to some of its attraction. I had been told over and over that conditions were variable—and not just some of the conditions, pretty much all of the conditions. My friends told me to expect everything from rough seas, strong wind and rain to bad visibility, extreme currents, and, of course, the wildlife (like the famed sand tiger sharks) not showing up. However, the long weekend I spent diving with Olympus Dive Center and exploring the wrecks proved them all wrong. The conditions were perfect: The sea was like glass, the sun was shining, the water temperature was 30°C (86°F), the bait balls of tiny fish were swarming, and there were dozens of monster-size sand tiger sharks gliding over the wrecks. But apparently, I was very, very lucky. That being said, our trusted captain and crew chose the wrecks we dived based on condition reports from other sites. (Always trust the captain.) We did not go to the U-352 German submarine because the visibility had been less than 15ft. The wrecks they chose had much better visibility of 20m+ (60+ft), and sometimes even better. There are also many options for technical divers looking to dive deeper wrecks or just stay longer on the shallower wrecks (many are in the 100 to 130ft range, which is fine for short recreational dives). Olympus offers special tech trips for those certified, and they can help divers get certified in technical diving. In the event of a rough day at sea where the dive boats do not go out (for diver safety), there are plenty of other things to do in the nearby area. The day before I flew out and could not dive, I took the ferry to Shackleford Banks, an island with a wild mustang population, as well as a very popular place for shelling, fishing, camping and just relaxing on the beautiful coast of North Carolina. The 20-minute ferry ride from Beaufort dropped us off right on the beach, and as I started walking in the sand, I noticed two women taking photos into the brush. Getting closer, I saw two copper-colored wild horses grazing on the grasses. After snapping a few pics, we all moved on to give them some space. Continuing on my walk, it was not long before I came on two more horses laying on the beach. Before I left two hours later, I had seen at least eight of these beautiful wild horses. The Beaufort Waterfront is also known for its excellent food options (particularly seafood) and is a great place to sit and watch boats come in and out. I visited the North Carolina Maritime Museum, which had an incredible amount of artifacts from Blackbeard’s ship, Queen Anne’s Revenge; and just a few miles down the road was the North Carolina Aquarium at Pine Knoll Shores, where I got to see a few more sand tiger sharks before leaving. Special thanks to Crystal Coast Tourism Authority and Olympus Dive Center.